'It's a darn mess,' said one local business owner who worries about access to his personal training business. 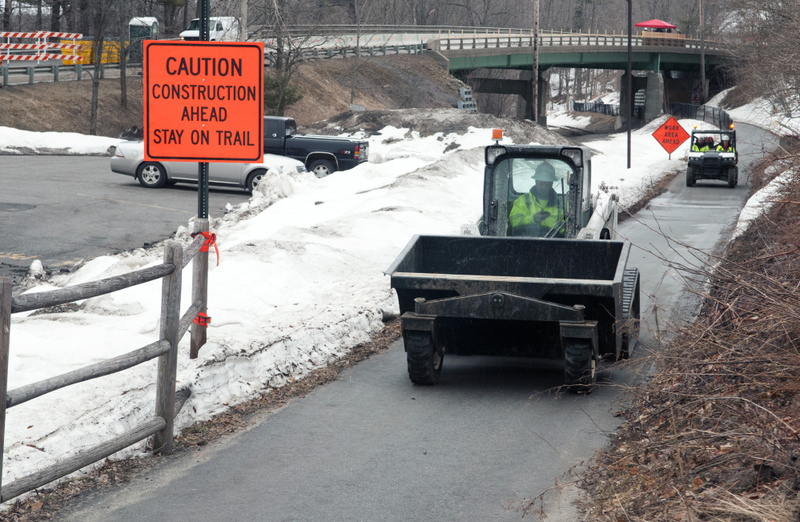 HALLOWELL — Traveling by motor vehicle from Hallowell to Farmingdale along the Kennebec River takes a little longer than usual and a little more patience these days. 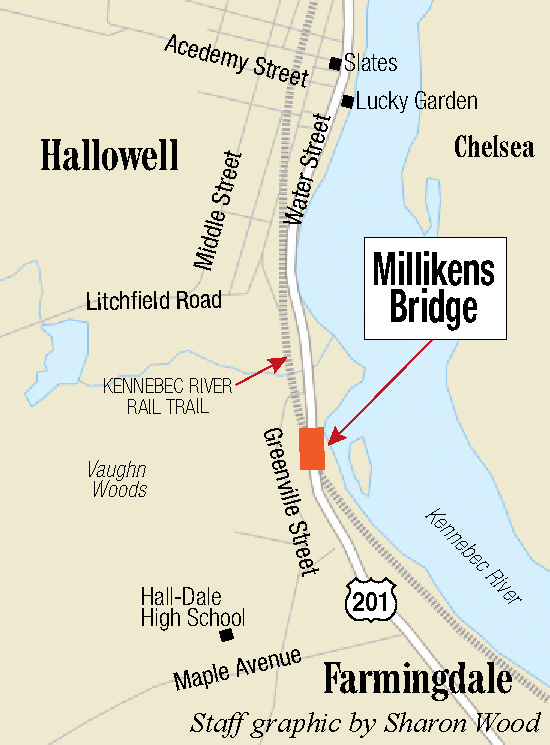 Traffic is down to one lane on Millikens Crossing Bridge, which carries traffic along Water Street, also designated Route 27 and U.S. Route 201, over railroad tracks just south of Hallowell’s busy downtown and about half a mile north of the Farmingdale town boundary. The traffic squeeze is needed to allow the bridge to be resurfaced one side at a time. 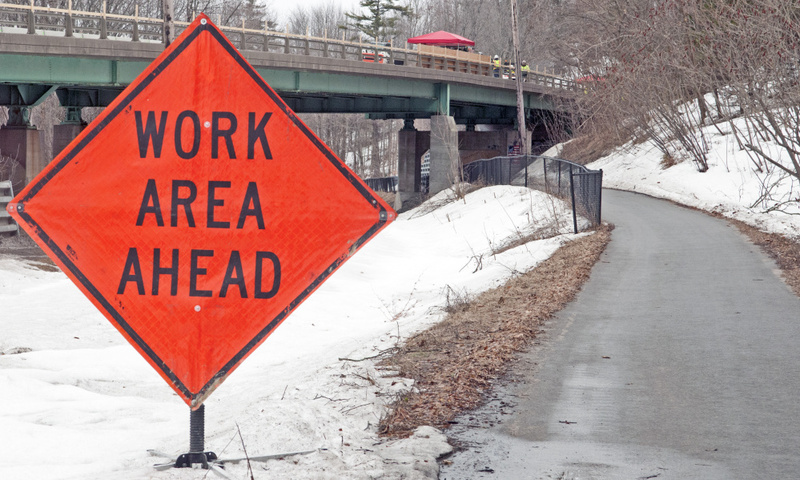 Gordon Contracting Inc. of Sangerville, won the state contract for the bridge preservation project, which began last week and has a completion date of May 26, although an advisory note from the Department of Transportation indicates the work will end by May 20. The traffic alternates direction every few minutes, with a traffic signal halting motorists in one direction while vehicles move past in the other direction. On Tuesday, the bridge work continued in the southbound lane as precipitation wavered between rain and snow. Barriers forced vehicles into single file in part of the northbound lane and shoulder, where several potholes revealed the depth of the work needed. Lou Berthel, owner and operator of Power Play Training at 301 Water St., which is next to the bridge, is concerned about clients and others being able to enter his parking lot. Southbound traffic occasionally backs up across the Water Street driveway entrance while waiting for the signal to turn green. This means those headed north find it hard to turn into his lot. He said the real test for reaching his business will occur each Wednesday morning, when he hosts 25 to 30 members of a business networking group. Berthel suggested moving the stop line for traffic about 10 feet to the north side of his driveway entrance. Berthel credited the state Department of Transportation for telling him six months ago that the bridge work was going to take place. However, he wonders about how long the project will take. “You could have blown it up and made a new one in that time,” he said. He said he noticed that the number of vehicles traveling along Water Street appears to be smaller than normal. He speculated that some of the drivers traveling between Augusta and Gardiner have opted to travel on the east side of the river and avoid the bridge work site altogether. He said Berthel’s clients and business acquaintances could be classified as such. “There’s no law or ordinance that says they can’t use those streets,” Nason said. He added that there have been no complaints from the neighborhood about an increase in through traffic. He said Hallowell police stepped up traffic patrols on the streets in the vicinity of the bridge work, looking for driving violations such as speeding. “It’s good we’re getting this work done, but it is an inconvenience,” Nason said. 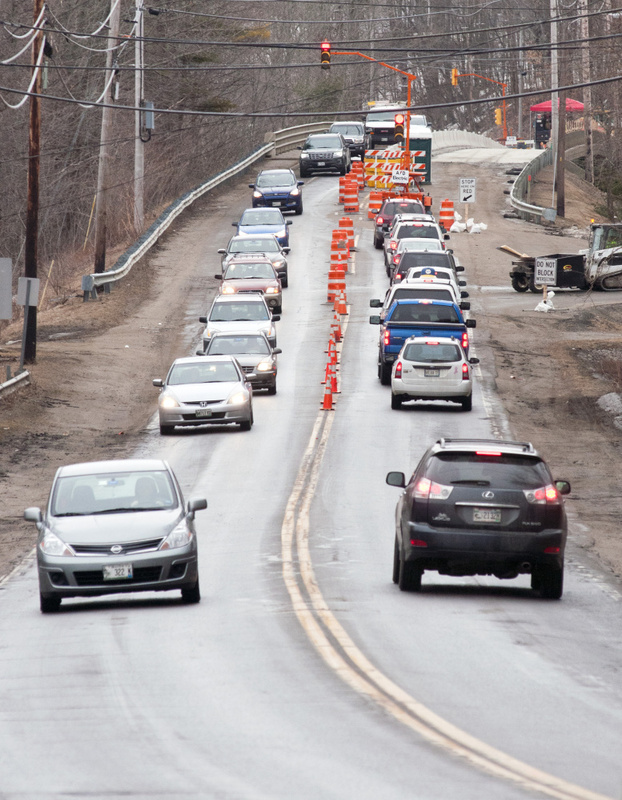 Nason said the situation would be different if a full road closure were involved, as was the case with recent replacement of the Maple Street bridge superstructure over the Maine Turnpike. In September, a similar project is scheduled to replace the Winthrop Street bridge. Gordon submitted a bid total of $472,777.17, the lowest bid among the four firms bidding. Wyman and Simpson submitted the next-lowest bid, at $554,000. The bids are posted on the department’s website.